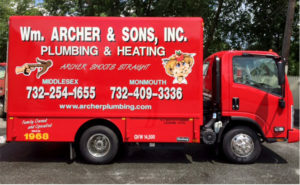 William Archer & Sons Plumbing is the undisputed champion of plumbing services in Monmouth and Middlesex Counties in New Jersey. We have managed to stay on the top because of many things – the most notable being our unmatched attention to detail. If you’re tired of receiving average plumbing services which don’t factor in cleanliness and hygiene, look no further. We don’t just fix your pipes. We take care of the entire mess created before and after we offer our services. It gets better! Our plumbers are the best in the business. We hire experts only which is why we are able to offer better service than everyone else. We don’t take plumbing casually which is why we hire and assign plumbers based on their area of expertise. Our plumbing services are also reasonably priced. Despite the fact that we work with professional plumbers only and offer unmatched additional services, we don’t overcharge our clients like our competitors. All our plumbing prices are reasonable and fixed. Our plumbing service variety is also unmatched. We offer the most conclusive plumbing service in New Jersey. We also offer services that complement plumbing. Once you come to us, you won’t need to go to any other plumbing company. We can offer any plumbing service you can think off and more! We also have a wide range of high-quality plumbing products ranging from water heaters and heat pumps to thermostats and furnaces, all from the best brands in the market today. What are you waiting for? 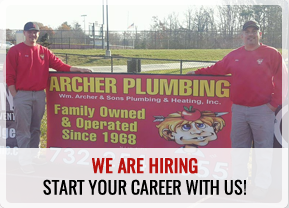 Call William Archer & Sons Plumbing Today at (732) 254-1655! Our plumbing services variety is inclusive of every plumbing and complementary plumbing service you can think off. We can repair, install or replace water heaters, broken/leaking water pipes, kitchen faucets, sewer lines, outside hose-bibs, sump pumps, toilets, showers, shower valves, sinks, frozen water lines… you name it! We can also help you out if have any heating problems in your home. Are your energy bills too high because of heating? Does your home have any cold or hot spots or perhaps a noisy boiler? If your answer is yes to all the above questions, we can help you. We offer the best plumbing solutions for all your heating problems. For instance, we can insulate all your hot water pipes to help you reduce heat loss, which will translate to lower energy bills. We also have highly qualified and trained technicians who are capable of repairing any heating system you can think off. We can also replace your current heating system with a more efficient one. We can help you increase your comfort while saving your significant money with our high-quality energy efficient home heating systems/appliances like heat pumps and solar water heaters. Contact us today for a complete evaluation of your home heating system. William Archer & Sons Plumbing also offers the best drain cleaning services in New Jersey. We can service sewer lines (all your piping) perfectly taking your home’s cleanliness and hygiene into account. The entire drainage system needs more care and cleaning than you think if you want to keep allergies and common pests and diseases at bay. We can clean your sinks, toilets, showers, tubs, sewers, drains, and disposers for you on a regular basis ensuring your home is sparkling clean inside out. From the above information, William Archer & Sons Plumbing is clearly the best plumbing services company in Monmouth and Middlesex Counties in New Jersey. Don’t hesitate to call us. We have a team of dedicated customer service professionals waiting to answer all your questions.